This display was last shown on January 22, 2000. From rural Sparta, Wisconsin comes the knitted designs of Joyce Williams. We are displaying her early works. Joyce has more recently been using Latvian weaving designs as her inspiration and has been persuaded to write a book about her recent designs as well as the many techniques she has created. The knitting world awaits her book. As you enter you first view the dramatic Star Tumbling Block coat. After gathering odd balls of yarn for several years, Joyce planned to make the coat to force herself to use colors she would ordinarily not wear. Inspired by quilt patterns, she chose the Star Tumbling Block as one of the easiest to convert to knitting. 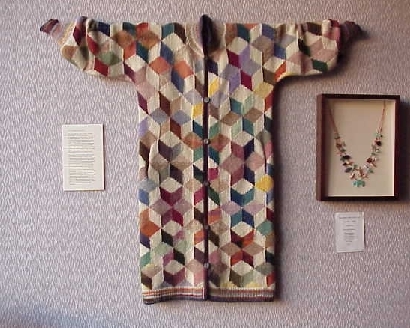 Unfortunately, that choice leads most people to assume she was inspired by Kaffe Fassett. Joyce's techniques also differ: elimination of all seams except for the three needle bind off at the shoulders, all knitting done with right side of coat facing knitter, using knitting back backwards technique, and all on several circular needles, knitting on each in turn. No bobbins were used; just lengths of yarn that could be pulled through the occasional tangle. The Bohus-inspired sweater combines the historical Bohus design with Joyce's inspiration as she gazed out her window onto the facerock of their farm. 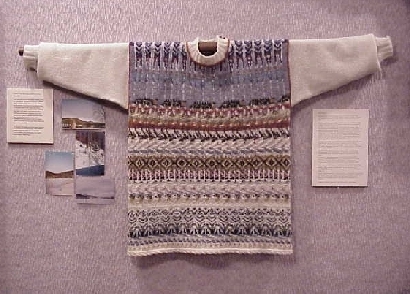 Photos show her view and a explanation of the Bohus history accompany the sweater. Joyce Williams favorite yarn is jumper weight shetland wool (count those stitches per inch) and the Fair Isle technique as seen in The Yoke Fair Isle, and two Fair Isle Sweaters. Notice the use of the traditional X and O's in the design. The Celtic patterned sweater has the braided I-cord trim that Joyce "unvented" (a term coined by Elizabeth Zimmermann as new techniques appeared). The braided I-cord also trims the Austrian style jacket with the shadow-box pattern on the sleeves. Unusual in its color pattern is the Cotton Crayon Cardigan. Space dyed yarn creates a block and angled pattern effect. Joyce Williams, a rural Sparta Wisconsin resident, was taught to knit in grade school at the age of seven. The entire second grade class in Sheboygan, Wisconsin spent half an hour each day patriotically knitting khaki squares for blankets that were sent to the British armed forces by the Red Cross. Joyce has knit since then and for many years followed written knitting pattern instructions. After reading KNITTING WITHOUT TEARS and KNITTING WORKSHOP by Elizabeth Zimmermann, in 1985 Joyce began to design her own knitted garments. She attended Elizabeth's Knitting Camp in Marshfield, Wisconsin, for the first time in 1986 and has been a faithful attendant every year since then. The Knitting Camp is now run by Elizabeth's daughter, Meg Swansen, an internationally known and respected designer, publisher, and owner of Schoolhouse Press which is a mail order supply house of books, tools, and yarn to knitters. Joyce considers Meg Swansen to be her mentor. Joyce has become known for the innovative knitting techniques she has developed, primarily to avoid some of the knitting processes she does not enjoy. She has had designs published in KNITTERS magazine, and her methods have been cited in knitting publications by knitwear designers who have used her innovative ideas. She has self-published several booklets which feature designs incorporating the techniques she has developed and she has produced videos in which she explains her techniques. Though unadvertised, they have been sold in most every state, Australia, Israel, and Canada. Watch for her book to be published in the next year or so by Schoolhouse Press. If her newest sweaters are any indication this book will be amazing.